Olathe East built a 21-0 first half lead on Friday night and held on Saturday afternoon to complete a 21-12 win over Olathe South. Quarterback Connor Leach threw touchdown passes to Braxton Love and Jalen Branson and Jordan Brown added a short touchdown run for Olathe East. Kyhiem Matthews rushed for 72 yards and Jake Seurer added 69 yards and a score for Olathe South. Braden Smith registered 11 tackles for the Falcons including two tackles for loss. Dodge City outscored Great Bend 24-0 in the second half in picking up a key 47-13 road victory in the Western Athletic Conference. The Red Demons opened the second half with 10 points off of Panther special teams miscues. A snap over the punter’s head led to a field goal and a blocked punt resulted in a Kelan Newton touchdown run shortly after and a 33-13 lead. Newton rushed for three touchdowns and passed for 85 yards and a score. Blaik Middleton led Dodge City with 176 yards rushing and two scores. Jonathan Allende led Great Bend with 190 yards rushing and two touchdowns; 176 of those yards came in the first half. Wichita Heights took advantage of two Wichita West turnovers in the third quarter to turn a 15-13 halftime lead into a 43-16 win. Rashiid Arnold returned an interception for a touchdown and Tre’ King scored shortly after a Pioneer fumble to propel Heights to the win. King finished with 67 yards rushing and two scores on the night. Jermaine Wiley led the Falcons with 80 yards on the ground. Jerma’l Campbell scored four touchdowns as Junction City had little trouble in a 56-0 win over Topeka Highland Park. The BlueJays scored all 56 points in the first half and Campbell had a big part in that output. He rushed for 66 yards and three scores on the night and hauled in a touchdown pass from Will Ervin. Blue Valley Northwest upset a ranked 5A team for the second consecutive week as the Huskies improved to 3-2 with a 31-28 win over Blue Valley. Northwest built a 14-0 lead before Blue Valley rallied to lead 21-17. Miles Alexander put Blue Valley Northwest back on top with a short touchdown run in the third quarter to lead 24-21. The Tigers answered with a Logan Brettell run to take a 28-24 lead with 6:30 remaining. Alexander struck again just two minutes later from 65 yards out to give the Huskies the winning score. He finished with 153 yards and two scores on the ground. Jake Rominger threw for 228 yards and two scores for Northwest. Cole VanEpps scored from 1-yard out with just under three minutes remaining to lift Andover to a 14-13 win over rival Andover Central. The win keeps the Trojans unbeaten on the season and drops the Jaguars to 2-3. VanEpps finished with 67 yards rushing on 10 carries in the game. Jaguar quarterback Blake Meier passed for more than 100 yards and two touchdowns. St. Thomas Aquinas finally broke into the win column in Week 5 with a 48-0 win over Blue Valley North. The Saints dominated the Mustangs in rushing for nearly 285 yards and putting up 475 yards of total offense. Danten Cosentino passed for 185 yards and three scores for Aquinas. He hit Ryan McNellis five times for 167 yards and three scores. Joel Edwards rushed for 112 yards and two scores for the Saints. Newton improved to 3-2 with a 28-7 Homecoming win over Goddard-Eisenhower. The Railers scored once in each quarter including two first-half touchdowns by Braedon Morrison. Jack Kingsley tossed a third-quarter touchdown pass to Cory Martens, and scored on a short touchdown run in the final quarter. Hays picked up a non-league road win at Wichita South, 31-6. The Indians endured a lengthy weather delay to build a 28-0 halftime lead, and then cruised in the second half. Preston Weigel rushed for more tha 100 yards and three touchdowns on 23 carries. The Hays defense held the Titans to negative rushing yards on the night. KC Piper scored 30 points in the second quarter to help win a 56-40 shootout with Lansing. The Pirates rushed for 258 yards in the game led by sophomore Sterling Owens’ 91 yards and two touchdowns. Colton Bebee added 51 yards rushing and three scores, Tanner Eikenbary rushed for 66 yards, and Travon Jones 50. Piper intercepted Lansing quarterback Krystian Abbott three times; two of which were returned for touchdowns by Sean Pahls and Maverek Dearinger. Abbot passed for 444 yards and six touchdowns. He connected with Kahlil Bailey seven times for 247 yards and five scores. Wamego outscored Abilene 49-35 to improve to 5-0 on the season and a win away from clinching the North Central Kansas League championship outright. Junior quarterback Kyler Anderson passed for 258 yards and four touchdowns and rushed for two more scores to lead the Red Raiders. Anderson connected with Trenton York six times for 190 yards and three scores. Goodland and Ulysses combined for an incredible 89 points in the second and third quarters, but it was the Tigers that rolled to a 75-34 win. Ulysses sophomore running back Ian Rudzik put up an unbelievable 467 rushing yards and seven touchdowns on 26 carries. He scored on runs of 23, 38, 70, 67, 6, 77, and 63 yards. Rudzik has now rushed for 1,094 yards and 15 touchdowns in the Tigers’ first five games. He rushed for 1,187 yards and 15 scores as a freshman last season. Tony Teeter threw for 286 yards and five touchdown passes for the Cowboys. Dax Ruhs had 174 yards receiving and three touchdowns for Goodland. Trey Robinson scored from 1-yard out with 1:03 remaining to propel Columbus (5-0) to a 32-26 win over previously unbeaten Galena. Robinson, who stepped in when starter Nathan Bole left with an injury, completed 13 of 16 passes for 204 yards and two touchdowns. Javohn Morill caught six passes for 132 yards and a score for the Titans. Galena was led by Gabe Helton who rushed for 139 yards and two touchdowns on 18 carries. Larned secured a winning regular season for the first time in more than 15 years with a 33-23 win over Cimarron. The Indians scored 26 consecutive points to turn a 16-7 deficit into a 33-16 lead over the Bluejays. Larned rushed for more than 300 yards in the game. The Indian defense intercepted Bluejay quarterback Caleb Fischer four times. Sedgwick improved to 4-1 on the season after posting a 42-7 victory over Heart of America League rival Hutchinson Trinity. Cardinal senior running back Dalton Brandt rushed for 195 yards and six touchdowns bringing his season total to 834 yards and 17 scores. The Sedgwick defense was especially strong in holding the Celtics to 93 rushing yards on 38 carries, registering five sacks, and forcing six turnovers. Riverton scored two fourth-quarter touchdowns to pull away from its nearby CNC League rival Baxter Springs, 35-12. The two schools are separated by less than four miles. Chandler Underhill passed for 140 yards and two touchdowns and also added 88 rushing yards and two scores for the Rams. Landon North led the Rams with 128 receiving yards and two touchdowns and now has 654 yards and seven scores on the season. Southeast of Saline scored 41 points in the first half in making quick work of Russell in a 55-0 win. Quarterback Cody Schlesener passed for 118 yards and two touchdowns and rushed for two more score for the Trojans. Nine different backs combined for 270 rushing yards led by Dane Long’s 82 yards and Keith Short’s 72 yards and two scores. 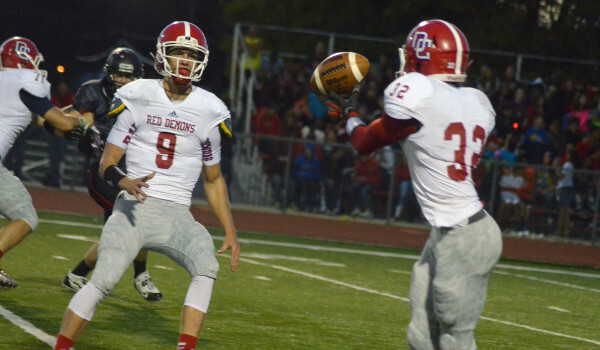 The Trojans will take on Beloit in Week 6 in a battle of unbeatens. Riverside remained unbeaten with a 52-7 win over Atchison County. Andrae McGaughy accounted for 309 yards of total offense to lead the Cyclones. He passed for 191 yards and two touchdowns on six of eight attempts, and rushed for 118 yards. Mason McCall caught three passes for 123 yards for Riverside. Scott City rebounded from their first loss with a 28-0 shutout of Hugoton. Paco Banda scored two touchdowns on the ground as part of his 54-yard night. Trey O’Neil passed for 130 yards and threw a touchdown pass to Sloan Baker. The Beaver defense held Hugoton to only 109 yards of total offense on the night. Oberlin-Decatur County blanked St. Francis 35-0 to open play in District 7. Dayton Dreher rushed for 156 yards and three touchdowns to lead the Red Devils. Oberlin scored 20 points in the second quarter to break the game open. The win was the fourth consecutive for the Red Devils in the series. Northern Heights won a close district shootout over Onaga 49-41. The Wildcats outscored the Buffaloes 16-6 in the third quarter which proved to be the difference. Both teams were led by outstanding junior running backs. Northern Heights’ Mitchell Wecker rushed for 194 yards and two touchdowns, while Onaga’s Michael Bliss totaled 198 yards and a score. Wyatt Cordell added 157 yards and three scores for Onaga, which rushed for 444 yards and lost. Litke Tucker passed for 172 yards and two scores for Northern Heights, while Wecker threw two passes for 72 yards; both touchdowns. The Wildcats had two receivers break 100 yards in Chris McWilliams (120 yards, 3TDs) and Colton Schumann (116 yards, TD). Luis Rodriguez rushed for 156 yards and four touchdowns as Oskaloosa beat Valley Falls 36-14. The Bears scored two fourth-quarter touchdowns to break open a 22-14 game. Bryce Stottlemire added 111 yards and a touchdown for Oskaloosa which picked up its second win of the season. Smith Center scored 30 points in the first quarter and blew past Washington County 57-0 to open district play. Clint Rogers rushed 18 times for 332 yards and six touchdowns for the Redmen. Rogers also added three two-point conversion runs. Smith Center is a substantial favorite in District 6, but will face contenders Ell-Saline and Plainville in the next two weeks. Northeast-Arma opened district play and Three Rivers League play with a decisive 39-6 win over Jayhawk-Linn. Quarterback J.T. Richardson passed for 179 yards and tossed two touchdown passes to Nick Younge who finished with 94 yards receiving. Richardson also led the Vikings with 139 yards rushing and two scores. Antonio Slingluff added 106 yards and a score on the ground. Central Plains opened district play by beating Canton-Galva 40-12 behind sophomore quarterback Braeden Crites. Crites passed for nearly 200 yards and four touchdowns and added 105 yards and a score on the ground. He tossed three touchdown passes to Layne Bieberle who had 168 receiving yards in the game. Defending champion Ness City built a 28-6 lead after three quarters in beating Quinter 40-22. Tanner McMillen passed for 140 yards and four touchdowns to lead the Eagles. He connected with Trevor Hawkins five times for 64 yards and a pair of scores. Chad Mohler led Quinter with 122 rushing yards and two touchdowns on 27 attempts. Hartford picked up its first win of the season by scoring late to beat Burlingame 42-38 in a game that was finished on Monday night. Jaguar quarterback Mason Esch passed for more than 300 yards and four touchdowns and also rushed for nearly 100 yards on the night. Hartford scored the game-winning touchdown with five seconds remaining to beat the Bearcats. In another game finished on Monday night, Lebo blanked Flinthills 50-0 to improve to 4-1 on the season. The Wolves led 30-0 at halftime thanks to a pair of touchdown runs by Brent Walford. Garrett Holmes finished with three touchdowns rushing and a fourth score on a fumble return. Lebo will take on Lyon County League rival Madison in Week 6. Tribune-Greeley County improved to 2-0 in district play by virtue of a 42-6 win over Wheatland-Grinnell. The Jackrabbits’ lead was just 14-6 in the third quarter before reeling off four unanswered touchdowns. Elijah Stone carried 38 times for 249 yards and two touchdowns to lead Greeley County. Cody Harney chipped in 82 yards and two touchdowns. The Thunderhawks’ lone score came on a touchdown run from junior Dominic Zimmerman. Sophomore quarterback Jacob Norris passed for 289 yards and six touchdowns as Norwich picked up its firs twin of the season with a 70-22 pasting of Cunningham. Norris hit Lucas Lohman on three passes for 135 yards, all of which went for touchdowns. He also tossed three touchdowns to Tristian Wallace. Norris added 197 yards rushing and three scores. He has passed for 1,173 yards and 19 touchdowns and rushed for 713 yards and 11 more scores this season. Fowler topped Rolla 42-36 in a great game in District 8. The Goldbugs led the Pirates 34-28 at halftime and each team managed only eight points in the second half. Fowler quarterback Taylin Bird passed for 201 yards and two touchdowns, while freshman Blake Keith also threw for 34 yards. Ty Clark caught 11 passes for 213 yards and two touchdowns and Luke Huleskamp added 208 yards rushing and two scores. Kyler Telford led Rolla with 261 yards rushing and three touchdowns. Blue Valley Randolph improved to 5-0 with a 46-20 win over Frankfort. Marshall Carey scored five touchdowns to lead the Rams to a district victory over the Wildcats for the second consecutive season. The Rams step out of district play in Week 6 to take on fellow unbeaten and No. 5 ranked Beloit St. John’s-Tipton.